Hey there! 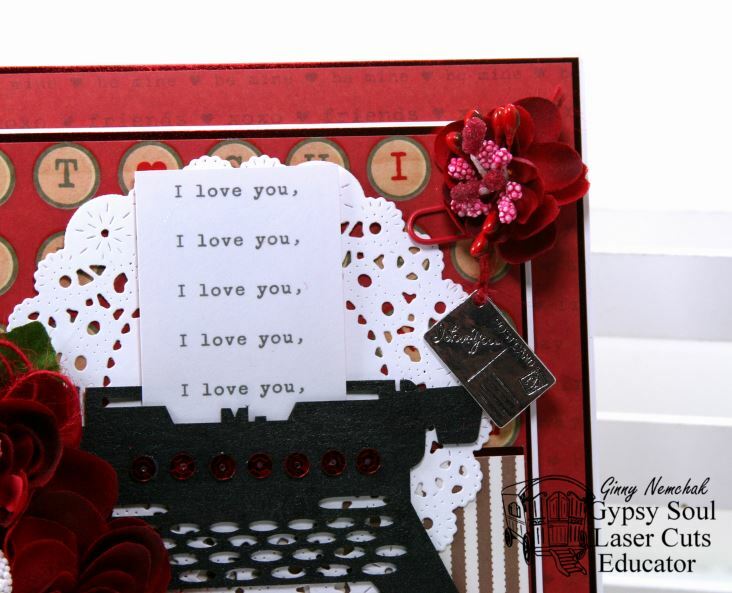 It’s Ginny here to share a very fun and whimsical Valentine greeting card. 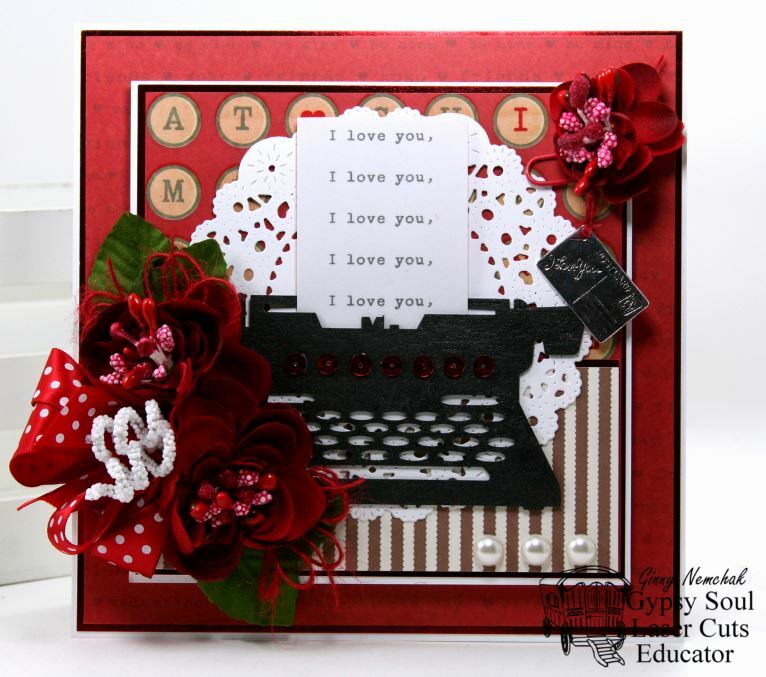 I mean who doesn’t like a vintage typewriter? So much better than a text message or email right? 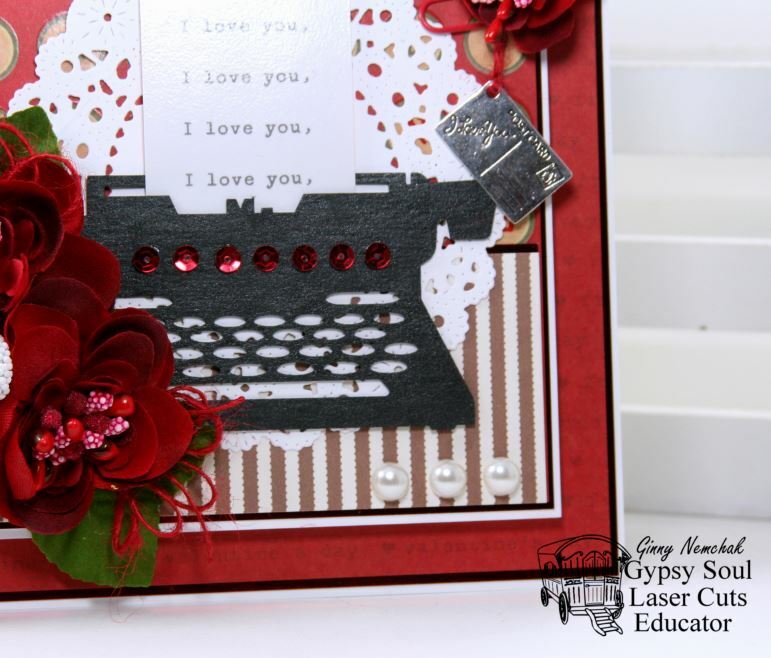 I was lucky to have some patterned paper in my stash that had type keys and the background was red so it was a perfect match! This sweet little sentiment was part of that same paper pad from Martha Stewart. The crisp white doily helps to break up the busy patterns. I chose the flowers and the polka dot ribbon to coordinate. One more flowers for the top and a tiny little love mail charm. Last but not least a few blingy pearls. Finishing this chippie could not have been easier….it’s just a metallic paint in graphite. So Simple! 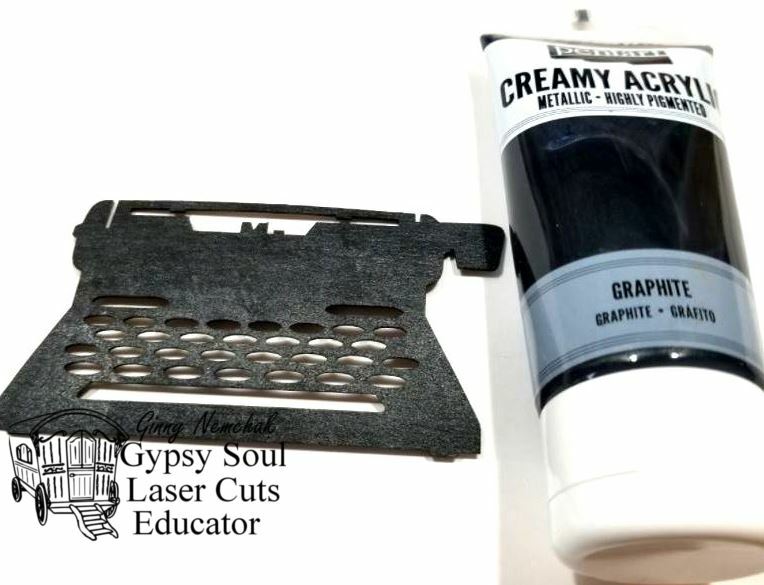 Gypsy Soul Laser Cuts~Typewriter Set. Hey there all my Peeps! I’m excited to share that I’m starting my New Years crafty goal for 2018 which is trying different color combinations and design styles. This card has a blue and green color scheme which is a bit outside my comfort zone…but I love how it turned out! I’m using the Nature Sketchbook Collection from Graphic 45 which is one of my favorites. It’s sooooo green lol. Just kidding…I really do like it. 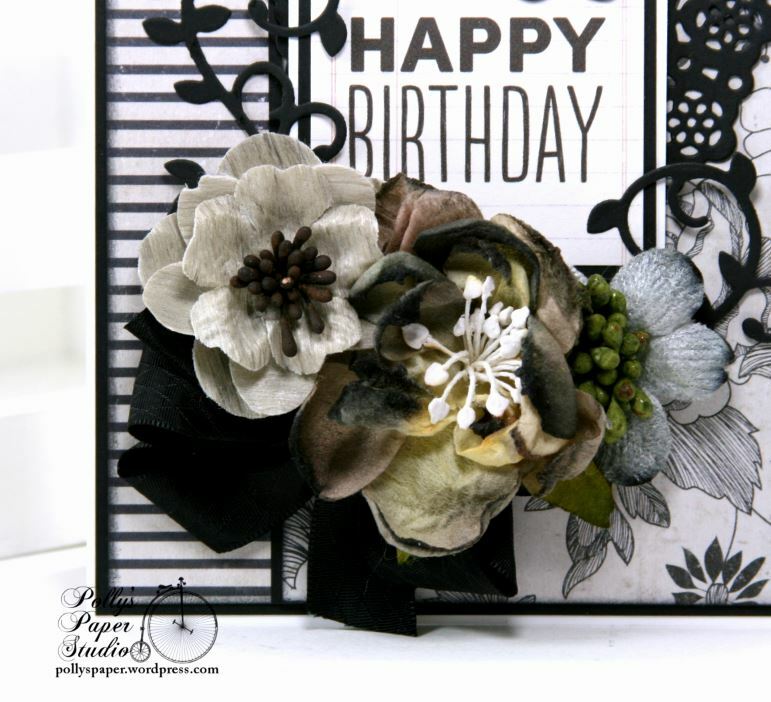 The idea behind this card was nature which was easy to accomplish using this collection. These Wild Orchid Crafts are dreamy. I did not hold back with the layering lol. There is a sweet little fussy cut butterfly tucked in and pretty chevron striped bow to fill in this arrangement. A bit of netting adds texture. Prills help to bring the colors in to the center focal image which is a cut apart from the collection. I just love the sentiment. This corner has a larger butterfly, more of the flowers and netting, and gold twine tied in a simple loopy bow. This clip was given a face lift with alcohol ink and now it coordinates perfectly! The chipboard frame is finished with antique gold embossing powder for a subtle shine. 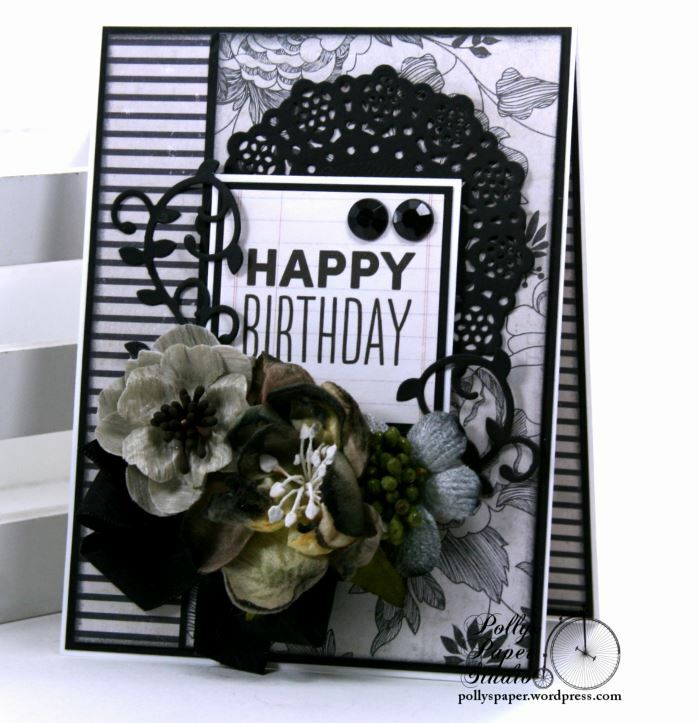 A bit of messy sewing lines adds texture to the patterned paper. The edges of the papers are all distressed and scrunched up which is a subtle..but effective accent. Look at all the dimension I was able to get with the layers. I’d say this is a good start to my new crafty goal. No pink in sight lol. Please enjoy this video I’ve prepared for this card…..
Polly’s Paper Studio~ The World is a Canvas Greeting Card. Really Reasonable Ribbon~ Chevron Striped Twill, Antique Gold Burlap String, Tea Rose Blue, Chrysanthemum, Sweetheart Blossoms, White Open Roses. Hey there Peeps! 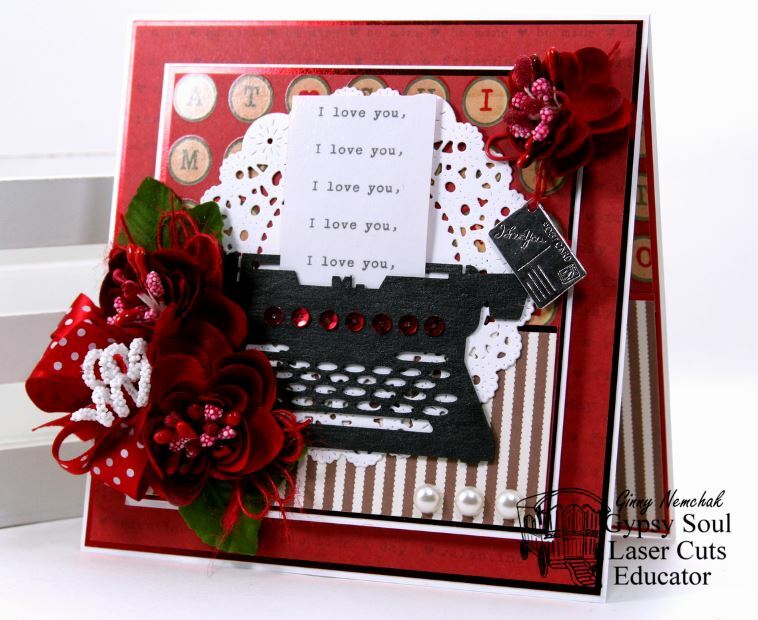 I’m dropping in today to share a large tag I created with some of my favorite card making elements. I did mention it’s large right? It’s 5 1/4 x 9 inches. Go big or go home is what I say. BTW this also applies to french fries lol. Pretty lace and trim with bling and pearls anchor the bottom of this tag and add sparkle. I’ve given a crackle finish to this Eiffel Tower chippie and layered a sweet sentiment on top. 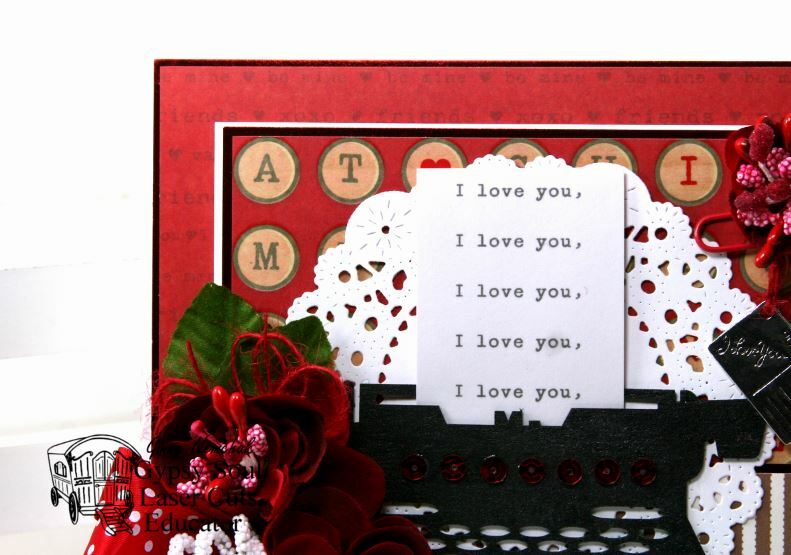 Matching sequins and die cut doily are the perfect accent to the textured chipboard. The background pattern is applied with a Ranger stencil and grape colored ink. 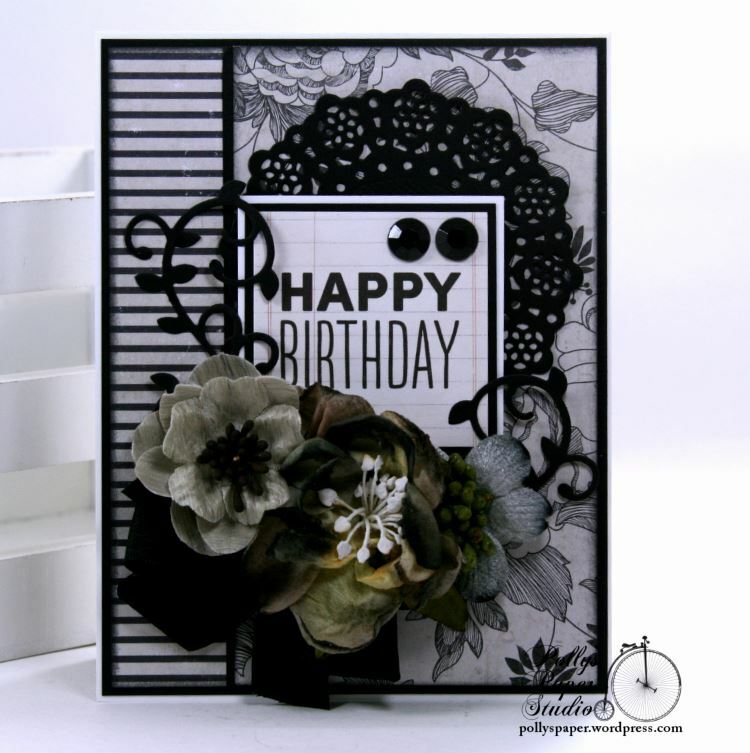 I’ve also inked the flourish die cut tucked into the flowers. This lovely little butterfly was the inspiration for this tag. I love these very purpley flowers so much I added some to the top and bottom of this tag. A bit of ribbon, and sugared berries, and Prills are the final element and I think they look great! Gypsy Soul Laser Cuts~ Eiffel Tower, Chicken Wire. Really Reasonable Ribbon~Violet Burlap String, Purple/ Lilac Berry Spray Cluster, Light Orchid Satin with Grosgrain Edge. Hey Peeps! 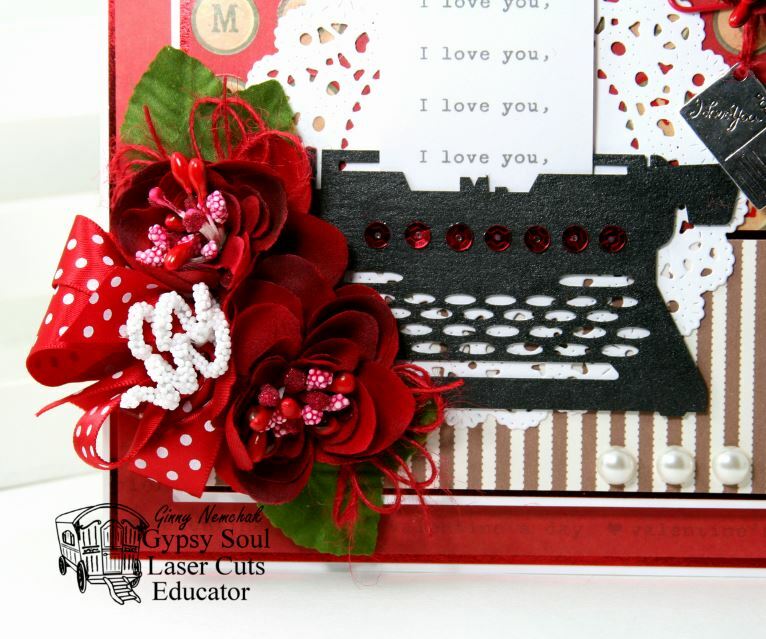 Ginny here to share a very classically styled Birthday greeting card. The sentiment is simple with a bold graphic font. Pairing stripes and florals is a striking statement in black and white. Pretty coordinating flowers layered over the ribbon to create a nice full arrangement. 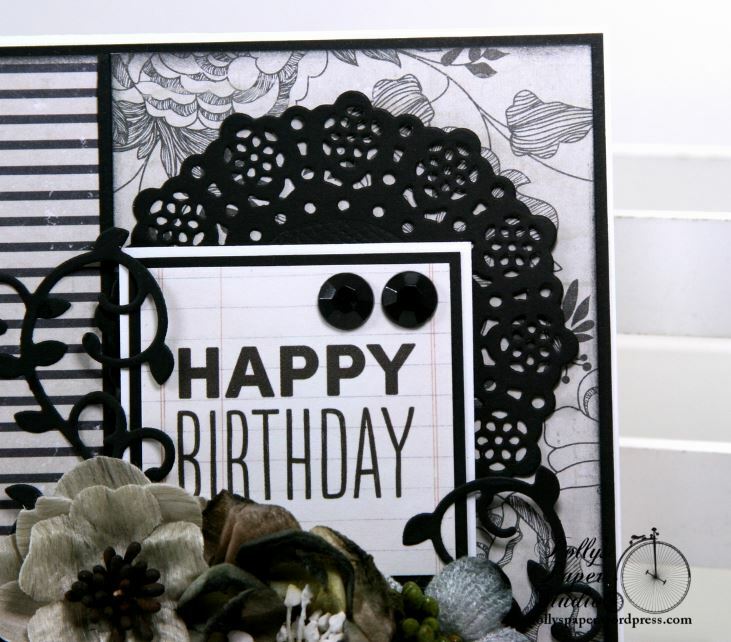 A doily die cut from flat black cardstock really anchors the sentiment and looks pretty tucked under the matching bling. Really Reasonable Ribbon~ Diamond Satin in Black.